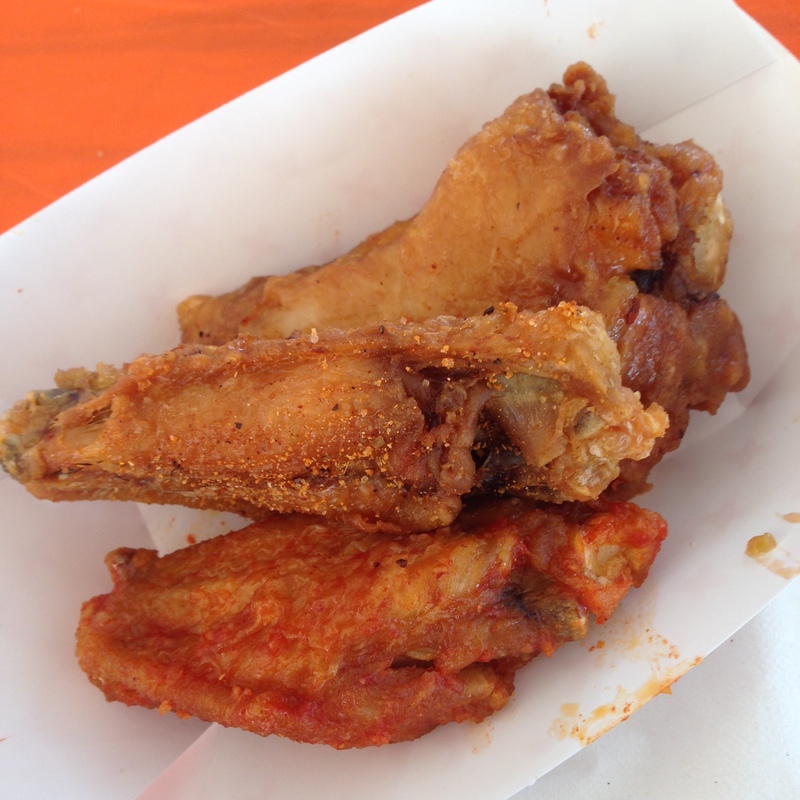 Even if you don’t like chicken wings, you’ll still have a great time at the festival. 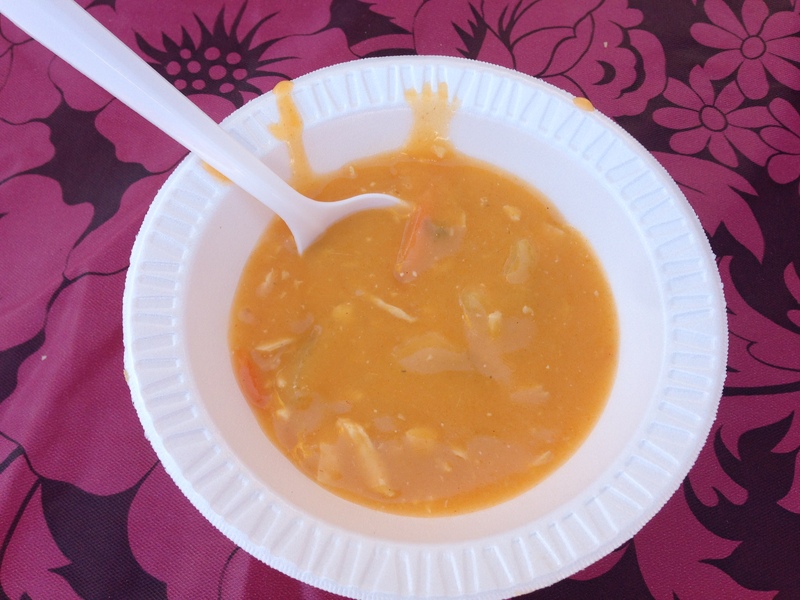 (Stay tuned for reviews on other delicious food items that were at the festival.) 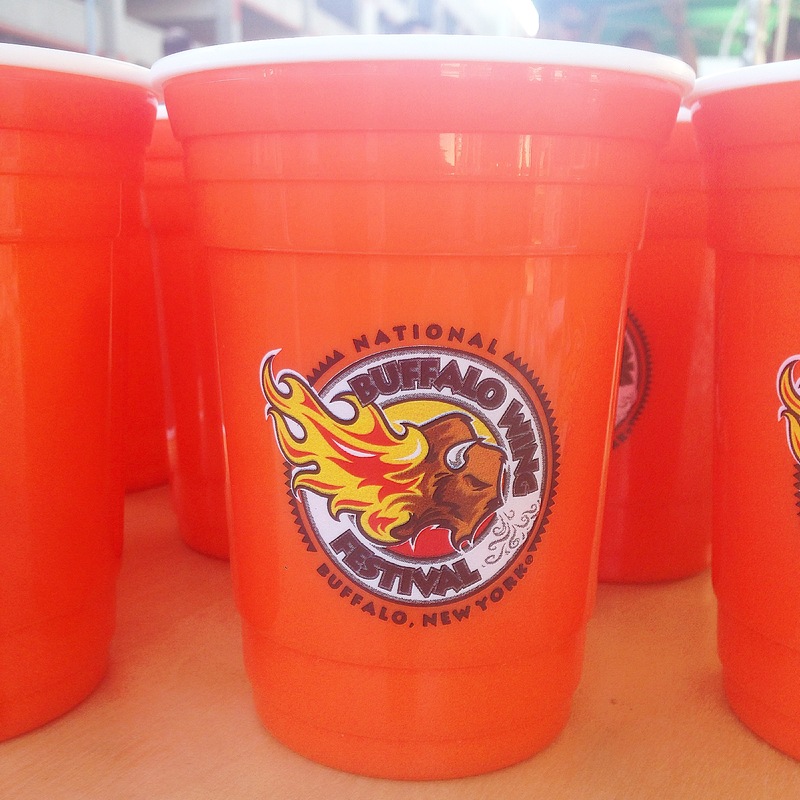 There really is something for everyone at the National Buffalo Wing Festival. As much as I loved the chicken wings, the entertainment was just as good, if not better than the food. See here for the entertainment. 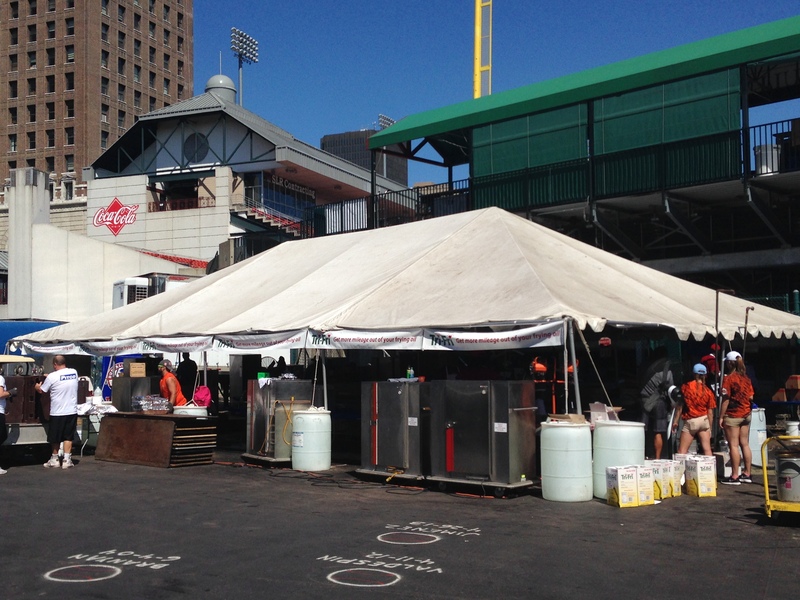 The festival is held at the Coca-Cola Field stadium. For baseball fans, the opportunity to stand on the field is reason enough to attend this event. One of my favourite memories is knowing that I was eating chicken wings between the 2nd and 3rd base. The festival is brought to you by Mr. Drew Cerza, also known as The Wing King. He beat Bobby Flay in a chicken wing showdown competition on The Food Network! Mr. Drew Cerza and all of his staff were the most responsive food festival organizers that I’ve ever dealt with. All of the staff and volunteers that I met at the festival were friendly, warm, and helpful, too! You really get a sense of the community and kindness that the locals are known for. 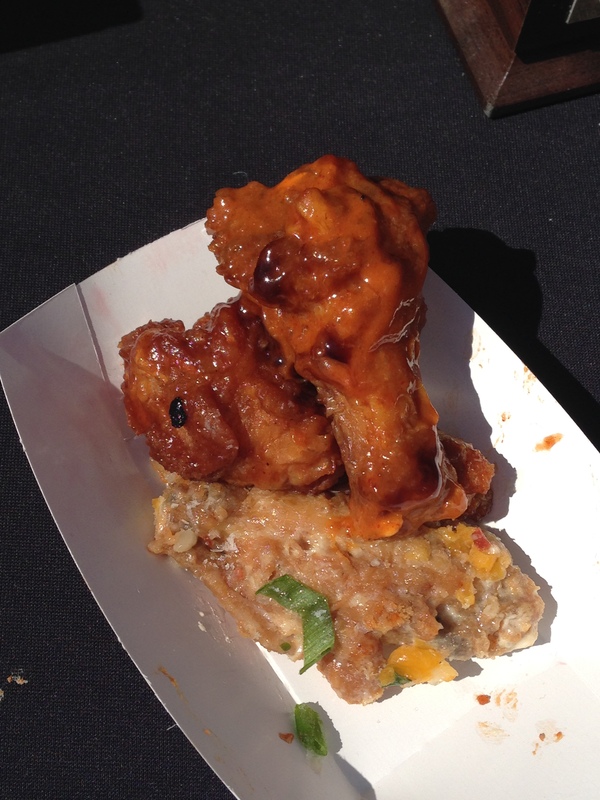 I was surprised to learn that a single distributor is used to provide chicken wings for this event. All of the wings are deep fried in a central fry station at the stadium. The vendors provide their signature sauces, toss the wings, and sell other food items from their booths. Tri-Fri oil was used for this event. It’s a blend of canola oil, safflower oil, and grapeseed or sunflower oil. The company claims that their frying oil has no trans fat, is cholesterol-free, and high in omega 6 and vitamin E. They also claim that their special blend offers more frying mileage, reduces flavour transfer and results in less oil absorption by the food. 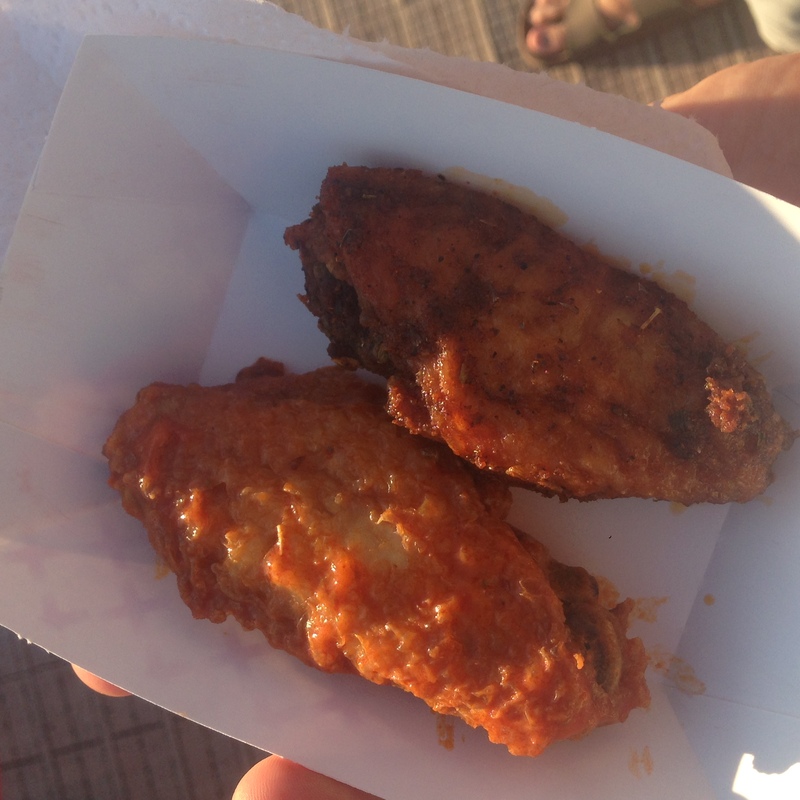 I had wings from the festival on both days, and I really did feel like the oil stayed fresh and the wings didn’t taste greasy. At this time, Tri-Fri is not yet available in Canada. A portion of the proceeds from this event are donated to local charities. (Another great reason to attend this event.) In 2016, the charities included Food Bank of WNY, Alzheimer’s Association, and Meals on Wheels. Leftover food gets donated as well. Admission tickets were only $5 per person (children 8 and under are free) and wings were only $1 each. Food tickets must be purchased ($1 each) to exchange for food. Alcoholic beverages must be purchased using cash. For $25, you could get a VIP pass that included admission to the event, access to the VIP party deck, a free commemorative beer cup, a free alcoholic beverage, and Amsterdam liquor samples. In 2016, you could also redeem your ticket stub at the Buffalo Seneca Creek Casino to get $10 in free slot play. Please note that although I attended the festival with a media pass, my reviews are, and will always be, honest opinions based on my personal tastes and experience. I tried at least one sauce from every single vendor except for one (the reason will be provided in an upcoming post). Below you will find Part 1 of my brief reviews of everything I ate. Anchor Bar is believed to be the home of the original buffalo chicken wing. 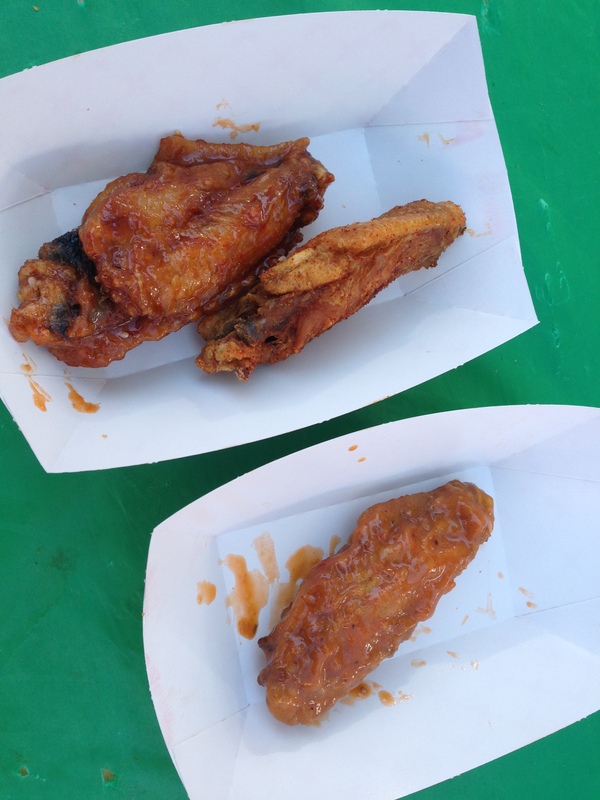 They sold the most wings at the 2016 festival. The sauce was more acidic than I am used to. The sauce felt rich and had a mild lingering heat. To be honest, I really didn’t like their sauce. This sauce had strong sour notes as well. I didn’t taste strong notes of garlic or parmesan. The sauce was good but I didn’t like the after taste. It was better than Anchor Bar. It was less salty and less bold in flavour than Duff’s. Their BBQ sauce won first place for Traditional BBQ Sauce. It was one of my husband’s favourite BBQ sauce at the festival. I thought it was quite good, but our wing was burnt. Their BBQ sauce is sweet. Boneheads Wing Bar had the best tent and many unique flavours. They won several awards at the 2015 festival. They won best Creative Sweet Sauce in 2016. It was a maple bacon flavour. Unfortunately, they sold out before we had a chance to try them. They also had fun mascots that you could take pictures with, like bacon and sriracha hot sauce. If you want to try Boneheads’ wings, be sure to get in line as soon as possible, because they had one of the longest and most consistent line ups all weekend. This was very good, but I wish that the flavour was a bit more bold. The balsamic glaze was simply drizzled onto a medium spicy wing. I liked the balsamic, but there wasn’t enough of it to satisfy me, because the underlying sauce wasn’t anything special. 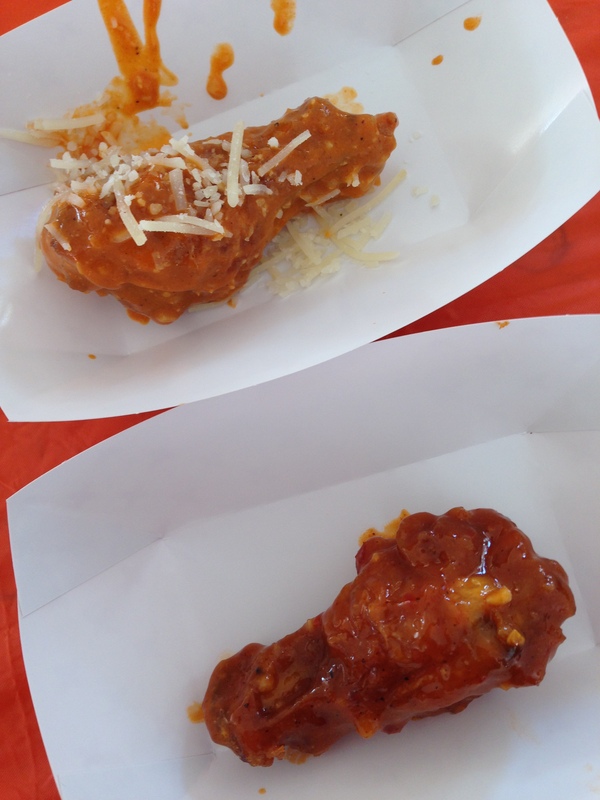 Their Loaded Baked Potato Wings was among my favourite flavours from the entire festival. It was so unique and so well executed; it really surprised me. You can really taste creamy potatoes, cheese sauce, and green onions. This wasn’t executed well. The medium buffalo sauce was just okay, and the coarsely grated parmesan looked appealing, but didn’t actually work well with the sauce. The flavours didn’t blend well together. This won 3rd place for the 2016 Craft Wing. It was quite good. It had unique flavours that reminded me of a ketchup or tomato base, mixed with some spicy BBQ sauce, and an Asian sweet and sour influence. They won 2nd place for Medium Traditional in 2016. Their medium buffalo sauce had the traditional flavours that I’m used to. It was quite good, but not as good as Duff’s. It was a bit too salty for my taste and had a medium kick at the end. They won 1st place for Dry Rub Wings in 2016. Their dry rub had a unique, moist and buttery paste consistency. The seasonings were very flavourful and complex. It was both spicy and herbally. It was quite good, although it wasn’t my favourite dry rub wing from the festival. I thought that this sauce wasn’t bad, but it wasn’t great either. I could taste a slightly bitter hint of rum. I felt really torn about this one. I loved some things about the sauce, but didn’t love others. For example, it was very buttery and had very flavourful, coarsely ground parmesan. But I would have preferred more garlic flavour and less acidity. They took home several awards at the 2016 festival. But to be honest, I’m not sure why. This won 1st place for Medium Traditional in 2016. I think I tasted celery salt in this sauce. It was unique, but I didn’t really care for it. This won 1st place for Creative Spicy in 2016. This was spicy. They used too much of a particular herb that I didn’t like. This won 3rd place at the 2016 festival for Dry Rub. I liked this sauce, and found it unique. It also had the best smokey flavour, but it wasn’t among my favourite BBQ sauces from the festival. I would have preferred that they added more of their seasoning to the wings, which seemed under dressed. It was also too salty for my taste. Flavour wise, although having completely different flavour profiles, I prefered this BBQ sauce to Brews Brothers Grille’s BBQ sauce. 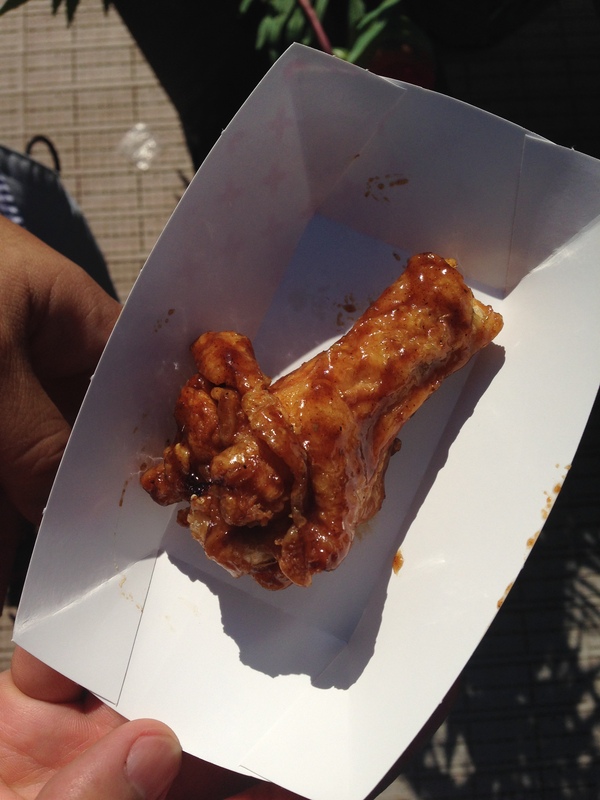 This saucy wing was one of my least favourite wings from the entire festival. All other flavours were completely overpowered by cinnamon. Danny’s is actually famous for their Chicken Wing Soup. See my review below under the header, ‘Other Food Reviews’. The vendors were very nice. 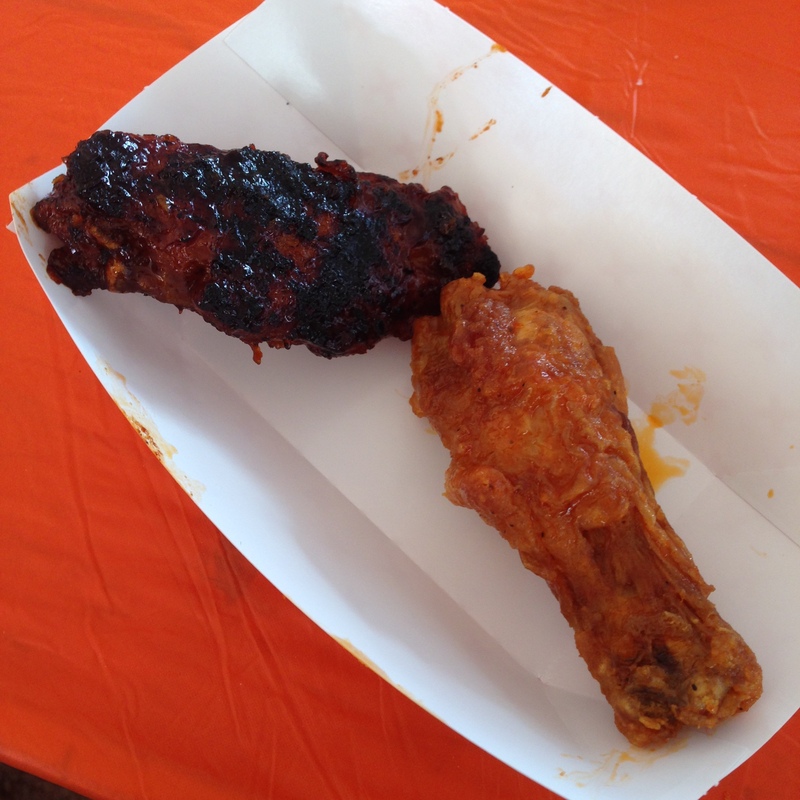 This wing won 3rd place for Traditional Hot Wings in 2016. I would say that this hot sauce had medium heat. The acidic notes were quite different from the traditional buffalo sauce. It’s the same acidic flavour profile as their famous chicken wing soup (see my review in the upcoming Part 2). I liked the wings, but I prefer the traditional buffalo sauce. If you’re curious about them, I would start by trying their soup and then getting their wings if you like the soup. Not everyone will like the acidity in their wings, because it’s unexpected. Duff’s is the other original establishment to serve buffalo chicken wings. The Duff’s location in Toronto has gone down the drain, but the Buffalo location is still doing things right. I would like to start by saying that one of the employees at the Duff’s booth spilled hot water all over my leg (from my knee down through my toes) on the first day of the festival. 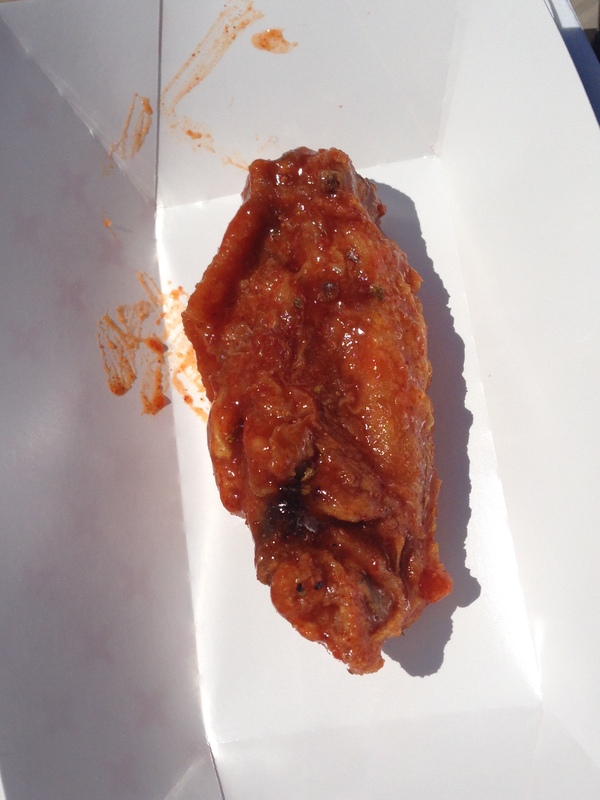 I was standing next to the booth eating their wings, when I suddenly got burnt. The employee was trying to empty a chaffing dish, by pouring the hot water onto the ground. I don’t think he checked to see if there was anyone standing there. What really disappointed me was how the situation was handled afterwards. All they did was give me a bag of ice. That was clearly insufficient first aid for a burn that spanned my knee to my toes. I had to request bottles of cold water to pour on my leg. They didn’t even inform me that there was a medical station that I could go to at the festival. (I didn’t find out until later that night). They didn’t fill out an incident report, a manager never spoke to me, nobody asked for my personal information, and my tweet about the incident went unanswered. I was very uncomfortable for a few hours, with my skin burning, but luckily my skin didn’t blister and I was fine by the end of the day. But needless to say, I was still very unimpressed. Now, having said that, I still recommend that you try Duff’s wings, because they made my favourite medium wing and my favourite craft wing. 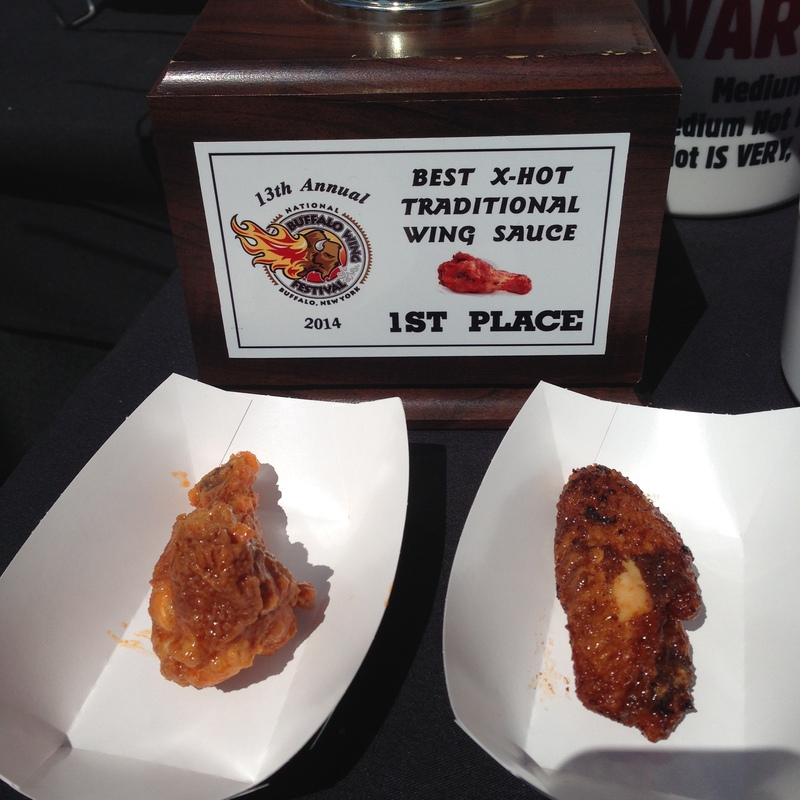 In 2016, they won 1st place for Traditional Hot wings, 1st place for Traditional Extra Hot wings, and 2nd place for their Craft Wing. I don’t know how they do it, but their medium sauce is buttery, and bold in flavour with the perfect balance of heat and richness. It’s a bit too salty for my taste, but totally worth it. This is the best medium buffalo sauce that I’ve ever had. This won 2nd place for the Craft Wing and I was very surprised that it didn’t take 1st place. I loved this wing. I don’t normally like sweeter sauces, but this was perfectly balanced. It tasted like an ever so slightly sweet, mild BBQ sauce. I also loved that they took the time to add char marks to these wings. I loved the unique chili pepper flavour and heat. However, I found that the sauce was otherwise quite bland and lacking in garlic flavour. I think this wing had a lot of potential, but it fell short for me. This sauce was very flavourful and unique. It wasn’t your typical American BBQ sauce. It was balanced with a mild heat and a mild sweetness from honey. I was disappointed that I couldn’t taste the same type of chili pepper as their other wing sauce. 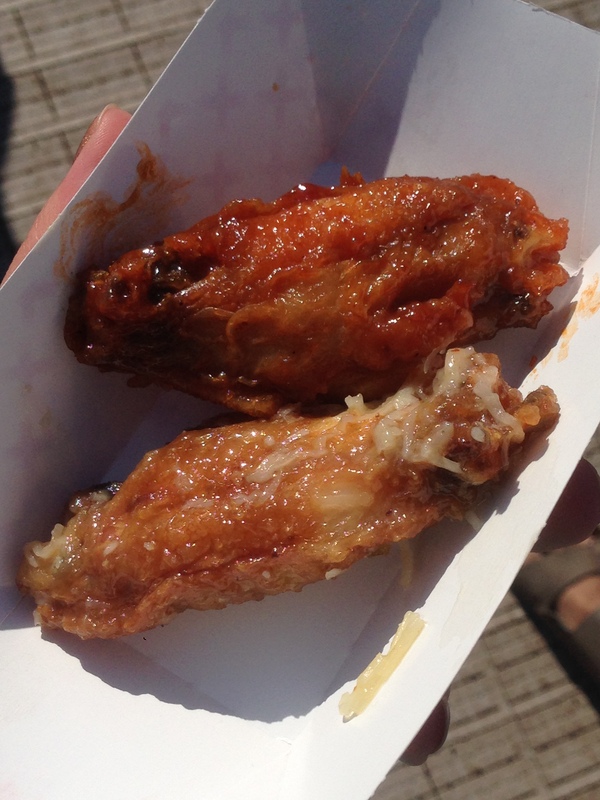 Although it wasn’t one of my favourite wings from the festival, it was my favourite wing from Forghedaboudit. This won 2nd place for Dry Rub wings in 2016. I thought that the seasoning was tasty, but very sparse on the wings. Also, I didn’t taste the bourbon or even BBQ flavours. These guys won the Rookie Award in 2015. The vendors were really nice. 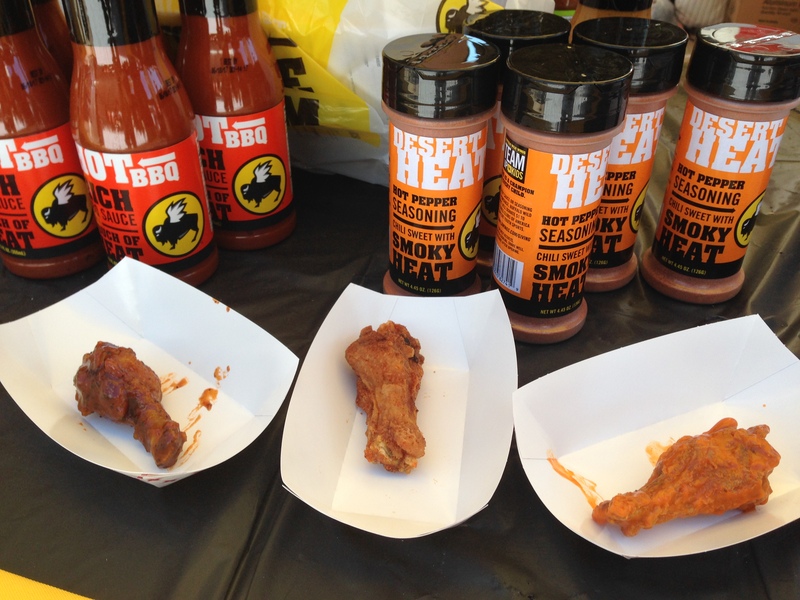 They were one of the few vendors that were tossing their wings in small batches. These wings had a great seasoning on them, although I wouldn’t call it authentic Creole. This was their, self-proclaimed, most flavourful sauce. It is made with garlic, cajun hot sauce, and BBQ sauce. It was surprisingly very good. Greene’s Ale House did an excellent job of blending strong flavours and turning them into a buttery and well-rounded sauce. This was quite good. It had a great traditional buffalo sauce base with a bit of sweetness and mild heat. See here for Part 2 of the reviews. See here for the entertainment.